New project ranks the nation’s journalists based on their personality traits and cynicism. LONDON—How cynical is the US media towards PR pros? A UK PR firm has attempted to answer that question by ranking the nation’s journalists based on their personality traits, in a bid to help foreign marketers better understand media idiosyncrasies across the country. 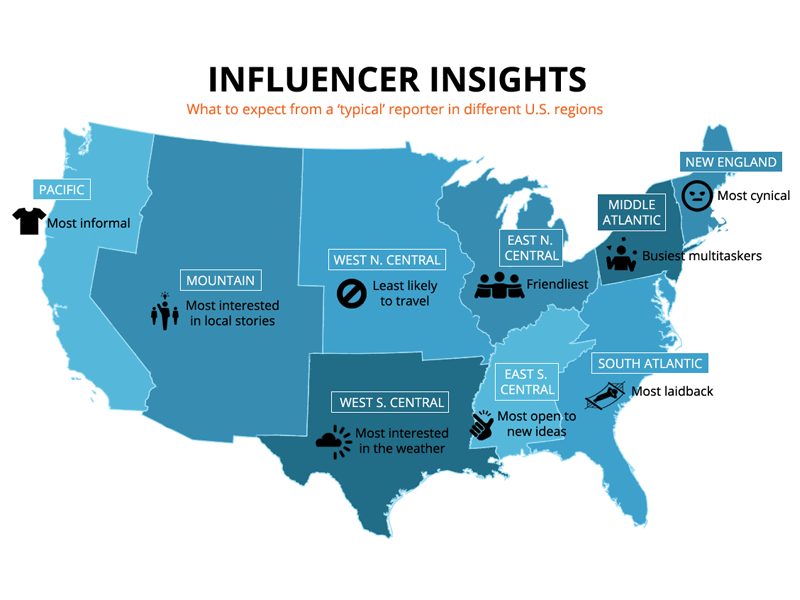 Unsurprisingly, perhaps, the Mid-Atlantic ranks third, with New York stereotypes reinforced by the description of influencers as being “incredibly rushed, frenetic and driven”. The project was led by CCgroup, who canvassed a group of nine US PR firms, comprising March Communications (New England), JCPR (Mid-Atlantic), Arment Dietrich (East North Central), PadillaCRT (West North Central), Interprose (South Atlantic), The Bradford Group (East South Central), M/C/C (West South Central), Linhart PR (Mountain) and Engage PR (Pacific). In particular, Fogg noted that popular depictions of the US as a homogenous media market are “nonsense." In addition to media personality and cynicism, Fogg found differences in entertainment norms and practices — "only in the Pacific, East South Central and South Atlantic regions is influencer hospitality considered acceptable” — and the approach toward news. "The US is a diverse communications environment and cannot be approached with a homogenous PR strategy," said Fogg. "Even the level of detail we’ve uncovered in this project risks gross oversimplification, but it demonstrates the value of working with regional specialist PR teams and hitting the road to build relationships with influencers across the US."